Notes: Has some scratching and dirt, the plating is wearing off in spots. Hardware seems to all be in place. For your consideration are these automobile emblems. The emblem reads “Oldsmobile”. They measure 2″ long and 1 1/4″ tall. It has some pits in the chrome. Please see pictures for more detail, and feel free to ask any questions! 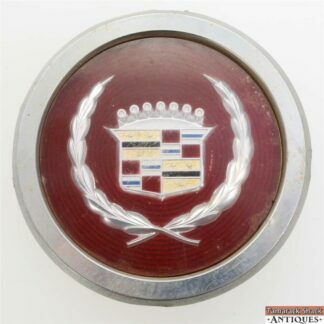 Vintage Cadillac Wheel Hub Cap Center Cover 4 1/4" Chrome Maroon Wreath Crest Set of 2 Cadillac Crest Emblems Chrome 2 3/4" by 2" Gold Plated 1 1/2" by 1 1/4"